Comics strangest super-team is back! Multi-billionaire Thayer Jost is looking to buy his very own superteam, paying Cliff Steele, formerly known as Robotman, for his services and leadership skills, as well as the Doom Patrol name. 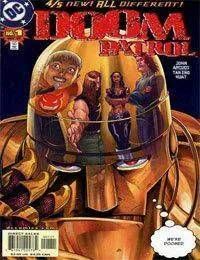 With four new members rounding out the team, Ava, Fever, Kid Slick, and Ted Bruder, will the latest incarnation of the Doom Patrol even survive their first mission?